EFCC JANUARY RECAP — with fresh “New Year” scent! The year’s first EFCC meeting focused on clearing slates and trying to breathe new life into committees undergoing tensions, challenges, and restructuring. Council also addressed traffic, street repairs and Spring 2016 event planning — plus, a tour through featured artist Brendan Siltman’s exhaustive portfolio. 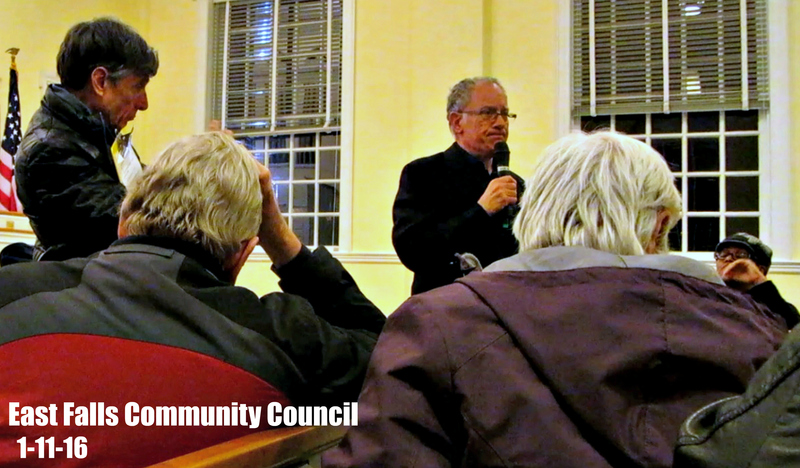 As the night’s featured artist fiddled with his laptop/projector screen/etc, president Bill Epstein shared the council’s sadness at the passing of dedicated volunteer & former 2nd EFCC vice president Claire Stilley last December. Plans are underway to re-name the council’s annual Volunteer of the Year award after Claire (also, life-long neighbor Linda Norris passed a card around for everyone to sign for Claire’s parents). New local business owner Brian Beard addressed the audience, next, announcing he’d taken over the Allstate office on Ridge early November 2015 and was looking forward to getting involved with the community. A South Philly native (“Point Breeze — but it wasn’t like it is now when I was growing up”), Brian graduated Central High, then college in Virginia, followed by some time raising his family in Illinois. 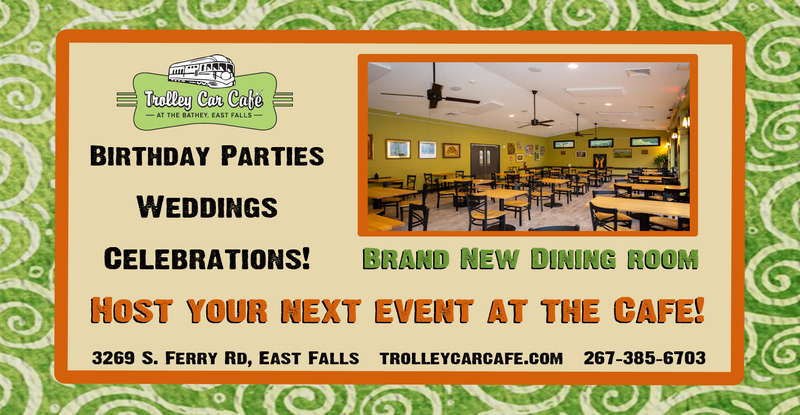 He and his wife moved back to the area (Collegeville, PA) about four years ago, and are hoping to grow a family business here in East Falls. 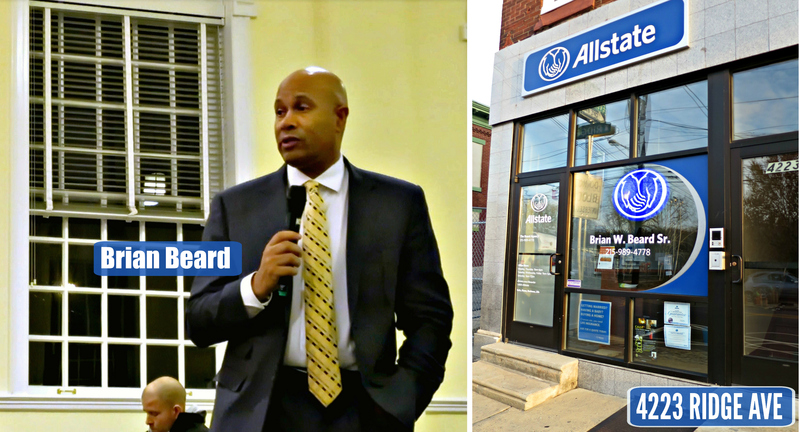 One of the reasons Brian chose to invest in an Allstate franchise is how community-oriented the company is, and Brian’s eager to get started — he’s already organizing a fire prevention event for East Falls’ five daycare centers, stay tuned for details and, meanwhile, stop in and say hello to Brian next time you’re in his neck of the woods. He’s a nice guy, totally worth a pop-in. Leza Perkins, an aide to Rep. Pam DeLissio, spoke next and left a bunch of printed info about PA’s budget, and announced a slew of meetings on the docket. For a run-down, Pam’s Facebook page has all the details, and also please stay tuned on this website for Pam’s new column on our Contributors page (which will be linked to high heaven for your convenience). Next came the Community Council’s featured artist, Brendan Siltman and… ummmm… Hmmm. I have no words. Does “Kaufmanesque” apply — Andy or Charley, either one — or am I reading too much into this? Representative clip provided here, please see the end of post for his full, 17+ minute presentation. After the treasurer’s unremarkable run-down, Bill presented for Events, announcing a call for Flea Market volunteers and hopes for an even bigger event this year, thanks to plans in the works for vendors to once again occupy inside the park as well as the perimeter (as long as they can protect the grass). Bill also mentioned how EFDC is no longer sponsoring East Falls’ bike race block party, so the executive council is considering picking up this event. If so, volunteers of all kinds will be needed. Paul Elia’s recap of EFCC’s dog park committee’s progress over the years provided the first of the evening’s several head-scratchers — although overall he offered a fair & accurate explanation of what the group has accomplished (except he left out the part where the committee fundraised & rendered architectural drawings for the land behind Trolley Car without first checking to make sure the property was actually available). The puzzler here is how the group seems dead-set on what comes across as really complicated, expensive plans that kinda feel over-and-above what most dog owners we’ve spoken with say they want: just a nice, basic fenced-in area to run their dogs off-lead (like the Roxborough Dog Park, which a lot of local dog owners make use of). 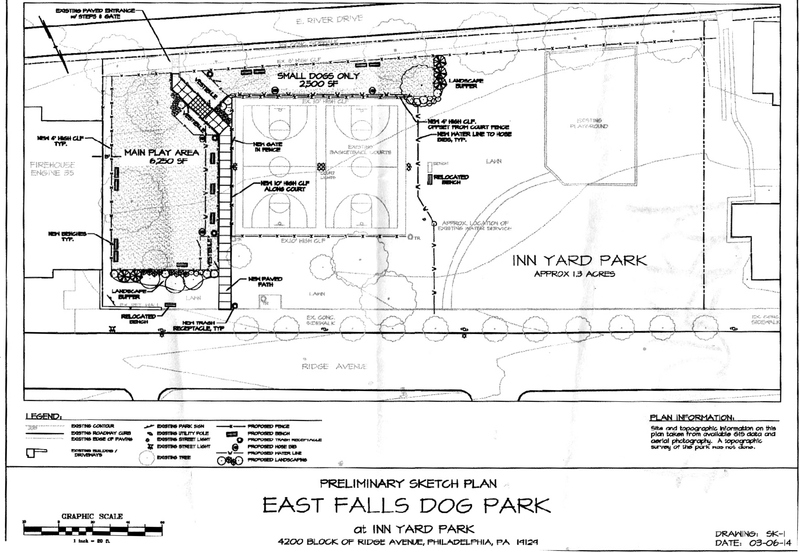 But EFCC’s dog park committee has a particular style of dog park in mind — with rather high-end design. For instance, instead of grass or wood chips, the group feels a product called K9 Grass is best. This artificial, anti-microbial substrate is easy to clean and attractive to look at but also adds hundreds of thousands of dollars to dog park construction (06:50), and even limits where such a park can go — this is why a dog park was rejected at McMichael, btw (06:22). 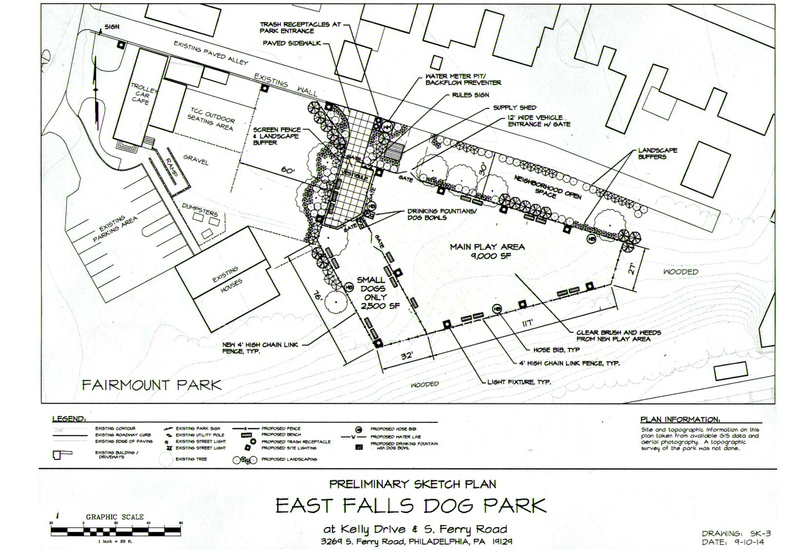 Hmmm… Paul also seemed to suggest that when Parks & Rec declined the committee’s plans at Inn Yard Park, it wasn’t because they opposed *any* dog park there, but rather they felt the area was too developed for the renderings submitted (01:20). Todd Baylson’s zoning report started off tantalizingly enough, by addressing recent “house-keeping” on EFCC’s zoning committee that speaks to a tension he’s been finding here lately, stemming from an inherent conflict in the RCO process. Registered Community Organizations were created to give “near neighbors” a voice on development adjacent to their property — however, sometimes these projects are for the betterment of the community, which leads to tension. Todd went on to explain new efforts to clarify our local zoning variance procedures, after which Meg Greenfield suggested more discussion beforehand is only fair (11:31) so it seems the committee is still ironing things out, here. So now I’m wondering: although there’s no cap on the number of people allowed on the zoning committee, there is an application process. What’s the deal with that? Looks like EFCC doesn’t just want input from neighbors, but Council is weighing skills sets and experience levels… Investigating possible conflicts of interest… Seems a thorough, and very subjective vetting process. In other news, the speed cushions on Schoolhouse seem to have worked — at least, speeds are down from the 40’s to the 20’s (the posted limit), according to the findings of a recent traffic study. 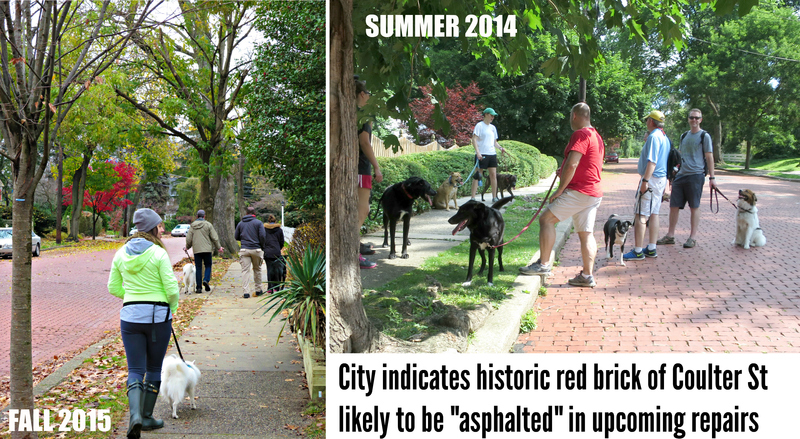 Also, the red brick part of Coulter Street will likely need repaving, and the City probably is not going to shell out to replace it. Understandable, but still: boo, asphalt. That’s a pretty street the way it is, shame to lose it. BTW, Bill and John seemed kinda angry about this “repair” work, almost as angry as they appeared when they complained about noisy school buses ripping thru the neighborhood. Which leads us to one final “Hmmmm” — apparently, these school buses don’t have to go through East Falls at all…? Long-time EFCC member Phil Hineline pointed out, the bus company isn’t just randomly being assholes: the light at the intersection in question prevents more than one bus from turning left, so these buses *have* to turn right, or they back up & it’s a whole different nightmare (one where kids are late to school). Just curious. Thanks for reading. I live in constant fear of your video camera. With respect to the buses, recently I noticed on the Abbottsford Ave side of Philly Transportation two places where buses could exit by turning right with some enhancements to the property. (Streetview on Google Maps would show the two points. One of which is closer to the train tracks crossing on the northern end of their site.) Wonder if anyone has suggested that? At least the buses could be sent multiple directions. I have observed some silly driving from them. To get onto Midvale headed towards Henry, they would turn Right onto Fox, Right onto Queen, Left onto Stokley and Left onto Midvale. I don’t get the full outrage people have but that pattern does seem silly. Funny, I’ve heard complaints about the buses at every meeting, and calls to get Fox 29 out here, and call Curtis Jones, bother police for more enforcement — all these “solutions” seem kinda passive-aggressive to me. No one’s ever suggested dealing with the actual traffic issue itself as you’ve described. Would *love* to see that happen! Seems to me — and this is just conjecture — that the Council is angry about this bus company, almost like it’s personal. 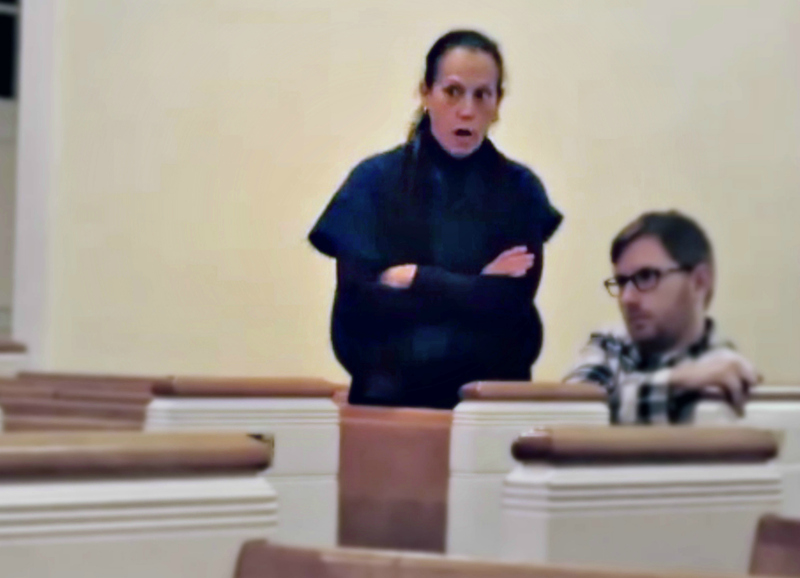 In the traffic video, after Phil Hineline speaks up (14:44) kinda in their defense, Bill seems to indicate Council has a deal in mind: “He has grounds to ask us for help” (?) — I think they want the bus company owner to pay for a light or something? Honestly, can’t we just crowdsource or fundraise or something? As I see it, the busses comply with EPA noise emission standards and they’re lawfully using public roads. It doesn’t matter if they do a daily tour back and forth through Apologen and Timber lane, as long as there are no legal restrictions in place they have a right to use any road they please. If I wanted to prevent a daily 5am parade of school busses coming down my street, I would concentrate on having legal restrictions put in place. Everything else is just whining and it simply won’t work.